Bob Thorson, Philip, South Dakota, with his father-in-law, Ed Tangren. Larry McQuistian, Ft. Pierre, South Dakota, with Jay Wright, Parade, South Dakota, who paid $8,500 for Lot 68. What a beautiful day for a good crowd to gather at Philip Livestock to look over this strong offering of Angus bulls! Folks were busy walking through the pens to make their top selections, catalogs in hand. 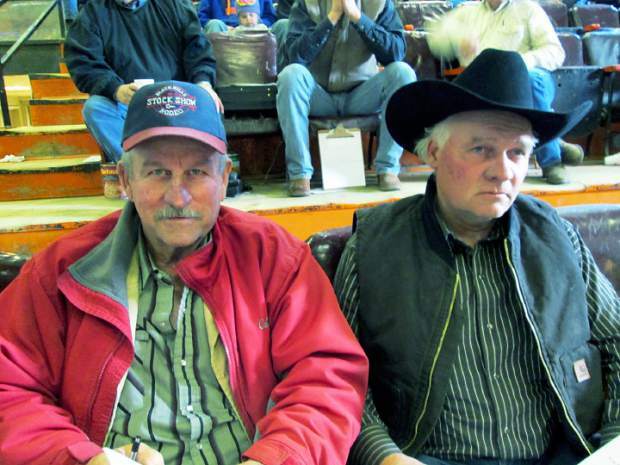 Todd Trask, Wasta, South Dakota, and Randy Peterson, Rapid City, South Dakota, have once again teamed up to present Angus bulls for the area cattlemen. The heart of these programs is calving ease and maternal characteristics. Another top priority is soundness, along with built-in carcass characteristics. These cattle are bred to maintain themselves in the breaks off the Cheyenne River. Cows in this country have to take care of themselves and bring in a big calf in the fall. The bulls were not pushed for extra big yearling weight numbers. They were developed for longevity, feet and legs, and breeding soundness. Todd and Randy expect these bulls to stay in their customers' herds for a good number of years, and they were fed to attain that goal. Trask and Peterson have a first year breeding guarantee, and they keep the bulls free of charge until late April when they deliver them for free. They also offer a discount for repeat customers. Top selling bull of the day was Lot 1, selling for $8,750 to long time repeat buyer, Pat Trask, Elm Springs, South Dakota He was a son of Connealy Consensus 578B and out of a daughter of Connealy Impression. His EPDs were CED 11, BW 0.2, WW 64, YW 112, and MILK 24. Born at 74 pounds, he weaned at 669 pounds, and posted a yearling weight of 1,360 pounds. His $Beef score was 110.21. Jim Wright, Parade, South Dakota, made Lot 68, his top choice at $8,500. He was a son of Rito 9I9 of Rita 5F56 6I6 and out of a daughter of Connealy 044 062. This bull had many of the right numbers. His stats included EPDs of BW 1.8, WW 58, YW 111, MILK 22, MARB 0.59, and RE 0.67. Born at 85 pounds, he weaned at 664 pounds, reached a yearling weight of 1,429 pounds, posted $B of 112.19, and had a 39 cm. scrotal measurement. Lot 46 sold for $8,250 to a Colorado buyer. This son of Rito 1W22 of Rita 5W17 9M25 was out of a daughter of GAR New Design 5050. With an 83 pound birth weight, he weaned at 645 pounds, and grew to a yearling weight of 1,475 pounds. His EPDs were CED 9, BW 0.1, WW 58, YW 112, MILK 22, MARB 0.66, and RE 0.52. Bruce Jensen, Owanka, South Dakota, bought Lot 26 at $8,000. Here was a son of Mogck Sure Shot who was out of a VDR Rose, going back to TC Rancher 056. He was only 74 pounds at birth, yet weaned at 690 pounds and attained 1,300 pounds as a yearling. His EPDs were CED 10, BW 0.3, WW 60, YW 104, and MILK 30. Patty Olic, Scenic, South Dakota, took a good look at Lot 30 and paid $7,750 to own him. He was a son of PA Power Tool 9108 and out of a daughter of TO 837 Rito Pride 101. Born at 78 pounds, he weaned at 664 pounds and yielded a yearling weight of 1,266 pounds. He had EPDs of CED 13, BW 0.1, WW 49, YW 89, MILK 34, MARB 1.00 and RE 0.53. Vern George paid $7,000 for Lot 34. 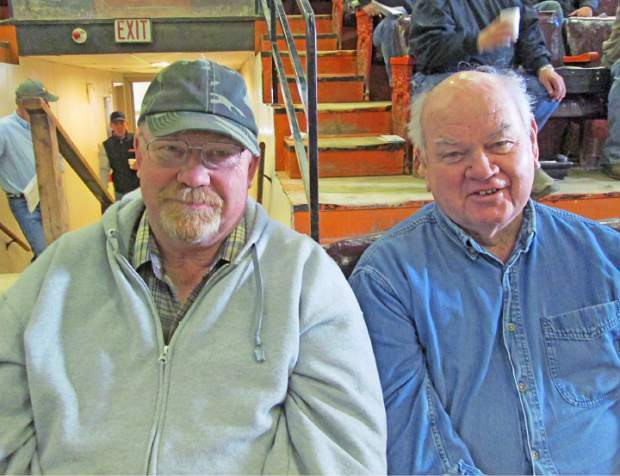 The Trask & Peterson sale is a good place to find just the right combination of genetics to complement many cow herds.